Tablet-News.net / Blackberry / Blackberry PlayBooks Only $299! 16GB, 32GB & 64GB Model ALL same Price!? 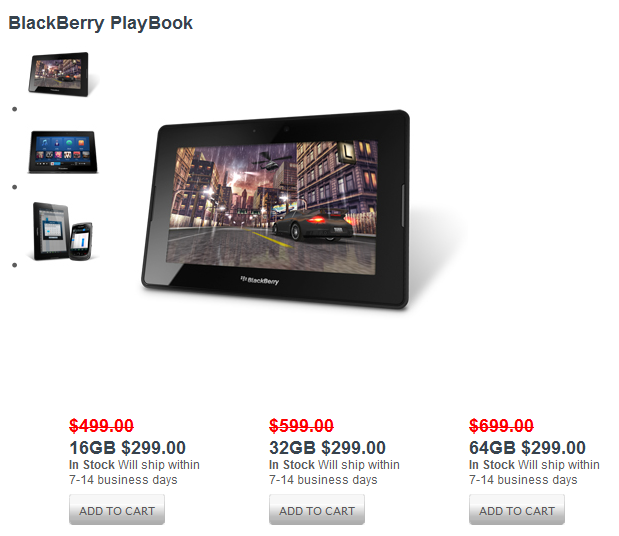 Check out this heavy price drop for ALL WiFi Blackberry PlayBooks!! The 16GB, 32GB and 64GB Version available all for $299! This is great for consumers who are looking to get a tablet under $300. In the U.S. RIM had previously had their PlayBooks discounted at $199 for the 16GB, $299 for the 32GB, and $399 for the 64GB but never had all three variations of their Wi-Fi tablet to just $299. You can save up to $400 from the starting MSRP prices from 2011! This offer is only available for limited time so make sure you grab yours quick! HERE. RIM even throws in free shipping! In Canada, where RIM is from, the sale tags are still $199CAD for a 16GB, $299CAD for a 32GB, and $399CAD for a 64GB if you look at RIM’s online store Canada.